We stayed at the Hyatt Place on Paoakalani Avenue during our one-week stay in Hawaii in 2015. 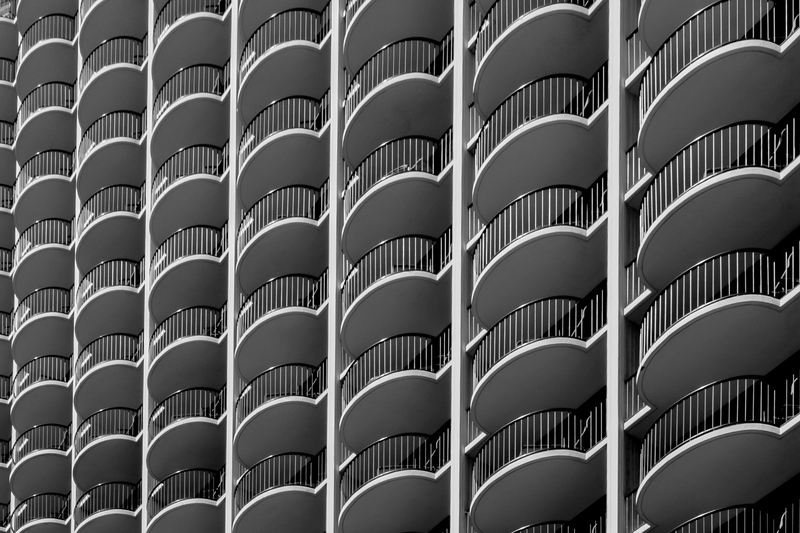 My entry for this week’s Monochrome Madness Challenge is a close-up shot of the hotel directly across the street from us. A close-up of the Waikiki Beach Resort and Spa in Honolulu. It’s the sprawling Waikiki Beach Marriott Resort and Spa and it stretches from Kalakaua Avenue to Kuhio between Ohua and Paoakalani Avenues. The resort has two towers and it is the second one near Kuhio Avenue that is directly across the street from the Hyatt Place. We walked past the Marriott every day on our way to the beach and Kalakaua Avenue, the main drag in Honolulu’s Waikiki district. This entry was posted in Architecture, Hawaii, Travel and tagged Honolulu, Leanne Cole, Monochrome Madness Challenge, photography, travel, travel photography, Waikiki, Waikiki Beach Marriott Resort and Spa. Bookmark the permalink. It looks like a series of eyelashes in their boxes. One small tip : I would straighten everything according to the line most left in the image.